The BOM for the current version is here. There's still no comprehensive guide or tutorial on how to build a chordata suit. Some previous experience on SMD soldering is advised. If you are planning to go for it consider documenting the process on the forum. That way others can get an idea of what the process is like, and if you have any questions or doubts we'll be there to help. If you are interested on testing a prototypical version of the system you might want to join our beta-testing program. Leave us a message here to get more information. it contains soldering instructions + an informal FAQ section collected from the questions on the forum. The main purpose of this guide is to give you an idea on how to build a Chordata motion capture system completely from scratch. 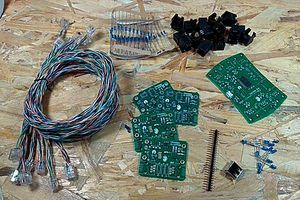 We searched to cover as many details as possible, allowing those of you who are still beginners to the DIY electronic world to go through all the steps. We are covering from the very specific to this system (like hoy to solder a K-Ceptor, the main Chordata sensing unit), to the very generic electronic procedures (like how to buy electronic components from an online retail store). If you are an experienced hacker, and you feel like you already know the things explained on a chapter, feel free to skip it. This page was last edited on 11 April 2019, at 15:11.